Treat yourself or that special someone to a soothing and romantic bath with this ritual bath kit gift set. 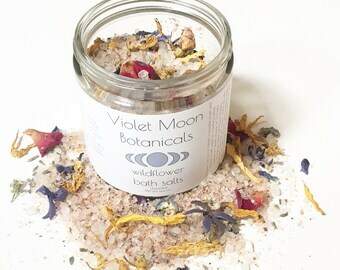 Contains everything you need for a self love ritual bath, or a romantic bath for two. 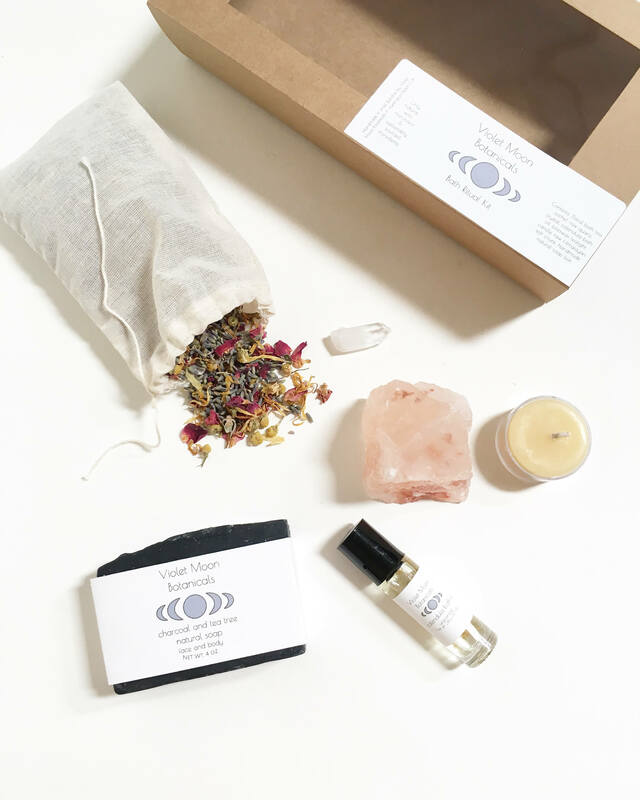 This kit comes with a floral bath tea sachet and raw quartz crystal to infuse your bath water with the essence of flowers and the purifying properties of quartz. Just add the quartz to the sachet, toss in the bath and soak away. Add the included Himalayan salt chunk to the bath for a soothing sea salt soak. This chunk of Himalayan salt is so big, you can reuse it! Just rinse off and let dry until next use. Use the calendula bath oil to create a moisturizing, skin softening bath, or use as a body oil afterwards to trap in moisture. Scrub away bad vibes with a bar of handmade natural soap of your choice! These soaps are all plant based and infused with essential oils and natural ingredients. Don't forget to light the beeswax tea light candle for added romantic soothing ambiance! Comes complete with a blank pressed flower gift tag for easy gifting! Each set contains hand picked flowers from sunny Southern California. Straight from my organically grown garden, I harvest and dry fresh California wildflowers by hand. I also include wild harvested flowers whenever they are in season. All ingredients are sustainably harvested, picked at their peak state and preserved for your enjoyment. *1 floral bath tea satchet - Usable with or without a reusable cotton pouch for easy tub clean up. Ingredients: calendula petals, rose petals, chamomile flowers, lavender buds. ~1 Raw Himalayan salt bath crystal chunk, reusable. ~1 Raw Quartz crystal - for use in bath tea sachet. ~1 1oz bottle unscented calendula infused bath and body oil - for use as bath oil, or as body and face moisturizer. Ingredients: sunflower oil solar infused with calendula petals. ~1 3-4oz bar of natural handmade soap - your choice of scents. Ingredients: *Sea Kelp Soap - coconut oil, olive oil, avocado oil, distilled water, sodium hydroxide(lye) Himalayan sea salt, castor oil, bladder-wrack kelp powder. *Floral Rose Clay Soap - Rose petal infused olive oil, virgin coconut oil, distilled water, sodium hydroxide (lye), shea butter, castor oil, rose hip oil, rose geranium essential oil, jasmine essential oil, rose clay, rose petals. *Charcoal Tea Tree soap - Olive oil, virgin coconut oil, sustainable palm oil, distilled water, sodium hydroxide(lye), hemp seed oil, castor oil, tea tree essential oil, activated charcoal powder. *Calendula Orange soap - Olive oil, virgin coconut oil, shea butter, distilled water, sodium hydroxide(lye), orange essential oil, calendula petals. ~1 natural beeswax tealight candle. For more natural beauty products, crystal infused oils, relaxing floral bath teas, bath salts, vegan bath products, and more romantic spa and relaxation gifts for her check out our etsy homepage!